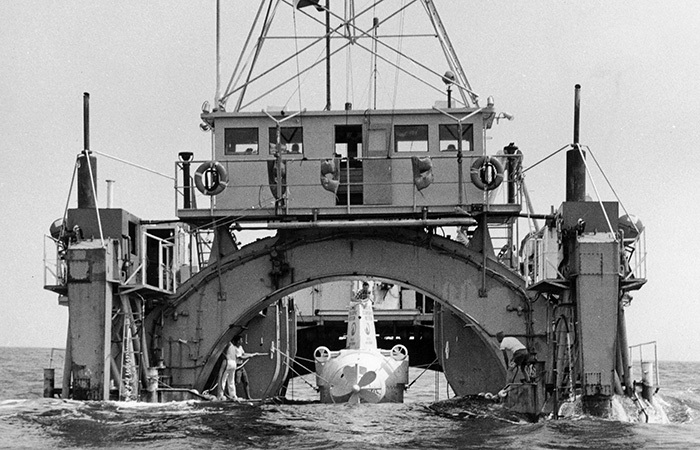 Draped in bunting and with a Navy brass band playing, the new research submersible Alvin was commissioned at the Woods Hole Oceanographic Institution dock on June 5, 1964. This year marks the 50th anniversary of two of America’s most iconic, cutting-edge vehicles: the Ford Mustang, and another vehicle that was hardly sleek or stylish and didn't have a bold, jazzy name. Three years after President John F. Kennedy committed the nation to the goal of “landing a man on the moon and returning him safely to the Earth”—and five years before we did so—a small stubby white submersible was constructed with the goal of bringing people to the bottom of the ocean and returning them safely to the surface: Alvin. Owned by the Navy and operated by Woods Hole Oceanographic Institution (WHOI), Alvin was officially commissioned June 5, 1964, in a ceremony attended by hundreds at the WHOI dock. Over its first half century, it responded to national crises, recovered a lost hydrogen bomb and investigated the impacts of the Deepwater Horizon oil spill. It helped document the world’s most famous shipwreck. It revealed seafloor terrain that scientists never imagined. It discovered unexpected deep-sea life thriving without sunlight, revolutionizing our understanding of where and how life could exist on Earth and other planetary bodies. It inspired the development of new generations of deep-submergence technology and vehicles, as well as generations of future scientists, engineers, and explorers. Much has already been written about Alvin, but a brief retelling of its story seems appropriate to celebrate the sub’s 50th birthday. In the mid-1950s, the deep seafloor was literally a black hole. Scientists had little idea what was down there and little access to find out. Submarines existed, but they did not go so deep and lacked windows. Auguste Piccard had built the bathyscaphe Trieste, a windowed sphere suspended under a blimplike structure filled with thousands of gallons of gasoline. But it was unwieldy and had no sampling capabilities. Charles “Swede” Momsen Jr., chief of undersea warfare at the Office of Naval Research, was a proponent of a deep research sub. He had seen plans for a small submersible vehicle called Seapup developed by Harold “Bud” Froelich, an engineer at General Mills Corp. (whose products once ranged way beyond cereals). In 1962, with Navy backing, the newly formed Deep Submergence Group at WHOI requested bids for a submersible based on Seapup. 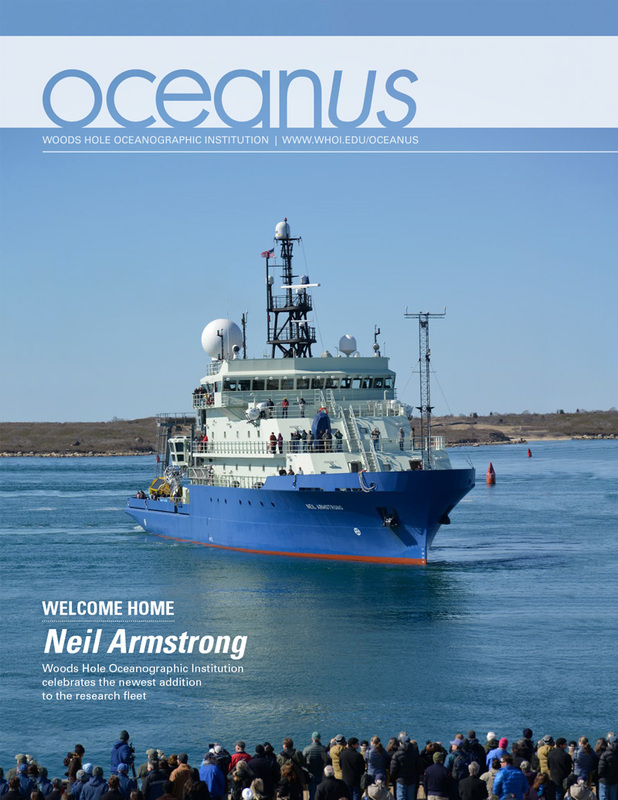 But the WHOI group had already started calling the proposed sub Alvin to honor Allyn Vine. Despite its lack of gravitas (and a cartoon chipmunk popular at the time), the name stuck and became official. With a $498,500 bid, General Mills won the contract to build a submersible capable of carrying three people to a depth of 6,000 feet. In 1962, Lukens Steel Co. in Coatesville, Penn., made 6-foot-diameter steel plates and shaped them into hemispheres. Hahn & Clay in Houston, Texas, welded them together to make three spherical pressure hulls—for Alvin and for the Navy’s deep-submergence vehicles Sea Cliff and Turtle, both now retired from service. During the two years of Alvin’s construction, General Mills sold its fabricating division to Litton Industries. Froelich remained with Litton, and the sub was delivered in May 1964 and commissioned in June. Later that summer, Vine, Froelich, and Alvin’s first pilot William Rainnie baptized Alvin in Woods Hole Harbor. Its first year or so was largely given over to test dives. The sub soon acquired its first “tender” ship. In the spirit of innovation and tight budgets that often characterizes oceanographic work, the ship that Alvin would travel on for two decades was constructed on Cape Cod from two surplus Navy pontoons, making a catamaran, with an easy entrance and exit for the sub in the middle. The tender was named Lulu—Vine’s mother’s name. Rainnie was first in a line of only 39 Alvin pilots. (By contrast, there were 74 space shuttle commanders between 1977 and 2011.) He and the first three relief pilots, Marvin McCamis, Valentine Wilson, and Edward Bland, were all ex-Navy submariners. Rainnie and McCamis made increasingly deeper dives, many in the Bahamas where the deep water of Tongue of the Ocean is close to shore. There, the submariners inspected the Navy’s ARTEMIS underwater listening array, fulfilling one of the objectives Momsen had promoted to secure Navy funding for the submersible project. Testing included one tethered, unoccupied, twelve-hour test dive to 7,500 feet, for safety trials. Alvin’s first piloted dive to 6,000 feet, its original depth rating, took place with Rainnie and McCamis both aboard on July 20, 1965, earning the sub Navy certification. Soon after, in January 1966, two U.S. Air Force planes collided over Spain, dropping a hydrogen bomb into the Mediterranean Sea off Spain's coast. The Navy called on the Alvin Group to help find it. In a two-month search, the Alvin team located the bomb on the seafloor and helped recover it, making the Navy very happy, cementing Alvin’s name and reputation in the public and press, and affirming even to skeptics its usefulness as an undersea vehicle. In its second year, Alvin settled into scientific operations around the western North Atlantic seafloor. As with any new endeavor in the deep ocean, a few odd events occurred. In July 1967, near the Bahamas, a swordfish impaled Alvin’s skin (not the personnel sphere). This damaged the fish far more than the sub. In September 1967, the sub’s manipulator arm came off during a rough recovery and sank —but was soon found on the sea floor, recovered and re-installed. Then in 1968, on the continental shelf south of Woods Hole, just before a dive, steel cables that supported the sub on Lulu snapped. With just enough time to react, pilot Ed Bland and the scientists aboard got out of the sub, and it slipped off its platform and sank in 5,000 feet of water. A debate ensued on whether to recover the sub because of the possible cost. But in September of 1969, the submarine Aluminaut and the Navy research ship Mizar found and lifted Alvin. The only damage was to Alvin’s sail, which was unavoidably broken to insert a hoist bar. Alvin was repaired and soon back at work. 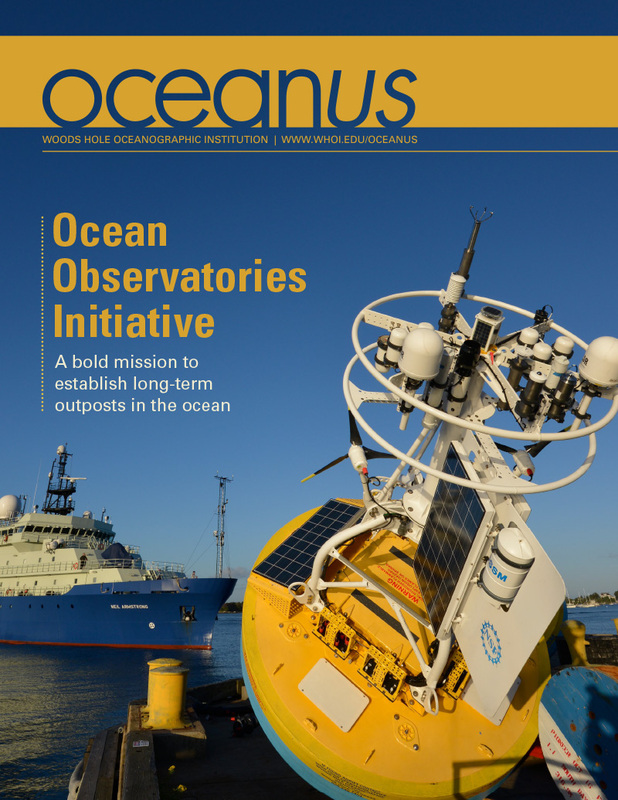 One unforeseen outcome of Alvin’s immersion sent ripples through the ocean science community. Lunchbags abandoned at the sinking were still in the sphere. After nearly a year in seawater at 5,000 feet deep, the bologna sandwiches were sodden and the apples wet. But they were not decayed and would still have been edible. WHOI microbiologist Holger Jannasch wasn’t too surprised; he had expected decomposition to be slow at cold temperatures in the deep sea. 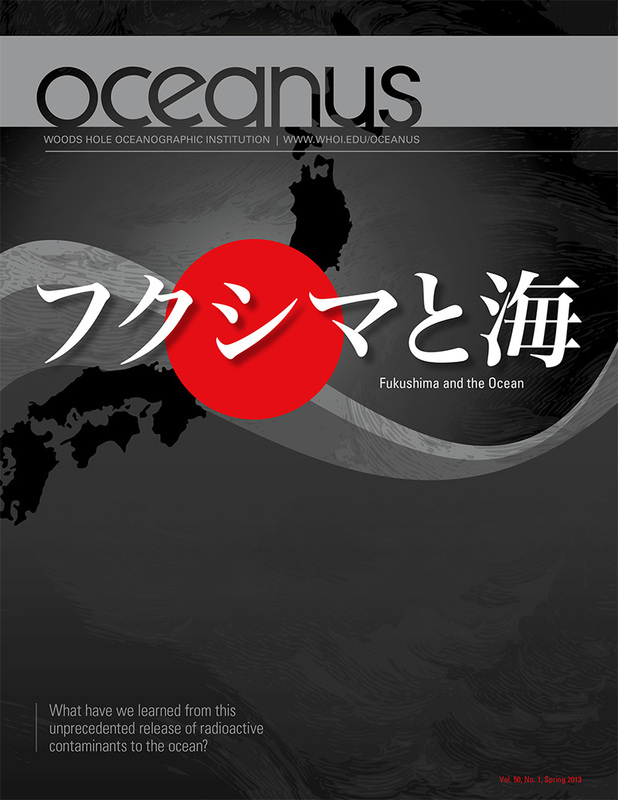 “It was not the well-preserved quality of the foodstuffs that startled us,” he wrote, “but the utterly simple means of overcoming the decompression problem, used in this involuntary experiment.” The decompression problem was this: When scientists brought bacteria adapted to the high pressure of the deep ocean back to the surface, the rapid decompression killed the very microbes the scientists wanted to study. Suddenly, he saw that instead of bringing the microbes up, they could do experiments in situ in the deep sea, putting culture media in sample containers on the seafloor, allowing in seawater with ambient bacteria that would grow there, instead of at the surface. This insight “broke a roadblock,” Jannasch said, and led to new experiments, new sampling and culturing instruments, and a blossoming of deep-sea microbiology that has yielded unfathomed biochemical discoveries, some with commercial and pharmaceutical applications. In 1973, Alvin was proposed to participate in the French-American Mid-Ocean Undersea Study (“Project FAMOUS”) along with two French submersibles. The mission was to bring scientists 3,000 meters (nearly 10,000 feet) down to the Mid-Atlantic Ridge—the great mountainous seam that runs down the center of the Atlantic—for the first time. To reach these depths, Alvin’s variable ballast system was modified and its steel personnel sphere was replaced with a titanium sphere. After testing, the sub was officially certified to 12,000 feet (3,658 meters) depth, twice its original range. The upgrade was costly, and some scientists thought the money should be spent on other research. A godfather of ocean sciences, Maurice Ewing, infamously shook his finger in the face of WHOI scientist Bob Ballard and “threatened to melt Alvin’s sphere into titanium paper clips if FAMOUS wasn’t worthwhile,” wrote Victoria Kaharl in Water Baby, the Story of Alvin. 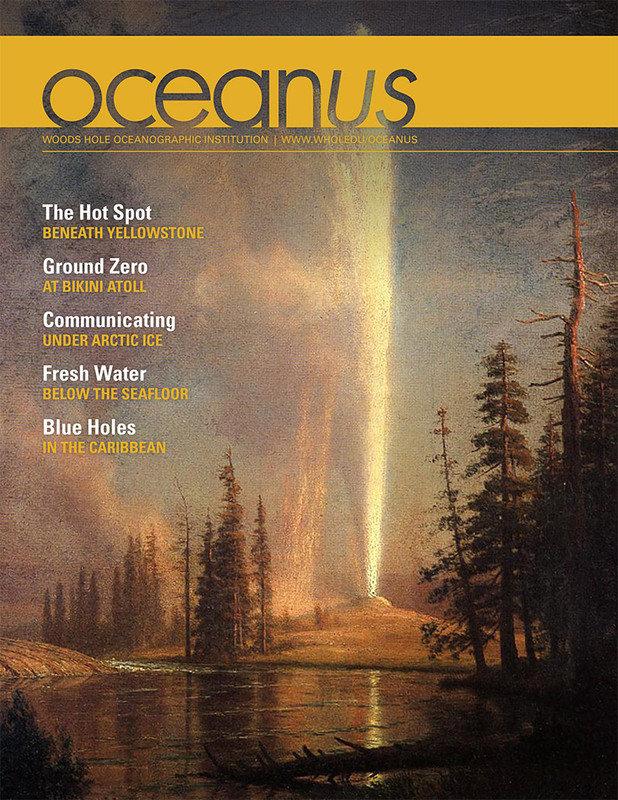 The gnarly, diverse landscape of rock and lava was hardly muddy and uniform as scientists had assumed from ship-based studies and dredging hauls, and FAMOUS helped confirm the nascent theories of seafloor spreading and plate tectonics. In the mid-1970s, Alvin was certified to depths of 4,000 meters (13,124 feet), opening more of the seafloor to human observation. Its greatest discovery lay just ahead. In 1977, Alvin transited the Panama Canal for the first time so that scientists could use the sub to study geology in the Galápagos Rift in the Pacific Ocean off the coast of South America. Geologists and chemists had detected chemicals in the area that suggested volcanic activity. They hoped to verify that when seawater percolated through cracks in the seafloor, it was heated by volcanically hot rocks below. They thought the hot water leached chemicals from rocks, rose buoyantly back to the surface of the sea floor, and vented back up through the seafloor, carrying chemicals into the ocean. Scientists diving in Alvin found these so-called hydrothermal vents. But, to their astonishment, they also found masses of big clams, worms, and mussels never seen before. Until they saw the vents, scientists had thought that animals living in the deep depended for food on sparse organic matter sinking from the sunlit surface. Instead, these organisms were thriving without sunlight, the energy source for all life on land. A return to the Galápagos Rift, with biologists, was planned, but first, Alvin needed upgrades. In 1978 the sub got a new titanium frame for strength, a new sample basket to bring back samples and specimens, and a new starboard manipulator arm, making it two-armed for the first time. In 1979, Alvin returned to Galápagos, where biologists confirmed that microbes—with the biochemical machinery to extract energy from chemicals coming from beneath the seafloor—formed the base of the food chain. Many of the larger animals had no mouths or digestive systems. They harbored internal symbiotic bacteria that made food for them in exchange for a safe haven to live. These previously unimagined ecosystems, chemosynthetic rather than photosynthetic, were some of the most profound scientific discoveries of the 20th century. Later in 1979, Alvin dove at 21° North, on the East Pacific Rise, discovering the first black smokers humans had seen. These tall chimney-like rock formations gushed high-temperature, chemical-rich, toxic, acidic black fluids. The discovery of such unexpected life in such extreme environments further expanded concepts of where life could exist. It expanded astrobiologists’ views on where to search for life elsewhere in the solar system. It also inspired scientists, students, and the public and made a strong argument to continue exploring the deep sea in Alvin. During Alvin’s 1982 upgrade, its sail was changed from white to orange-red to make it easier to spot when it surfaced. The next year, it said farewell to Lulu and hello to a new tender, Atlantis II. Around this time, scientists in Alvin discovered vent-like animals on the Florida Escarpment, a large, stepped, rocky platform off Florida’s West Coast made of long-dead corals, mollusks, fish skeletons, and other organic matter that accumulated over geological time. 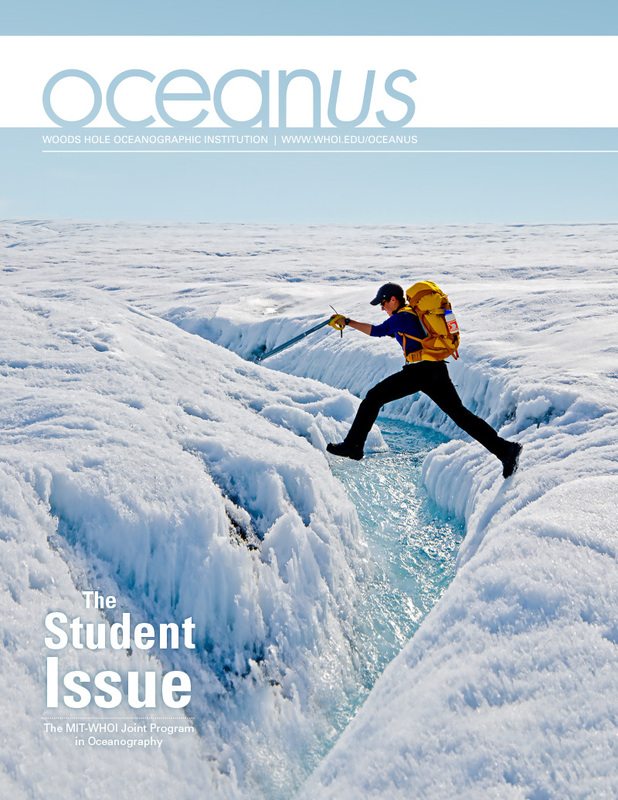 Through cracks and fissures in the carbonate bulwark, waters rich with hydrogen sulfide, methane, and other chemicals seep into the ocean and sustain chemosynthetic communities. Over the years Alvin explored similar habitats, called “cold seeps” in the Guaymas Basin off Mexico, the Gulf of California, and the Gulf of Mexico. In 1985 scientists in Alvin found the first hydrothermal vents on the Mid-Atlantic Ridge. They saw no tubeworms, the iconic animals of Pacific vents, but instead thousands of shrimp swarming around the vents in shifting masses. The shrimp were eyeless in the lightless deep sea, a development also seen in some cave-dwelling animals. Cindy Van Dover, the first and only woman to become an Alvin pilot was a WHOI graduate student in 1985. She discovered that the blind shrimp, which harbor chemosynthetic bacteria under their shells, carried another surprise—unique organs on their backs that contained light-sensitive "visual pigment", that is normally found in eyes. She hypothesized that hot vents might produce a faint glow, called black-body radiation, which the pigment on the shrimp could detect, allowing them to avoid the vents’ lethal superheated fluid. An experiment on the Juan de Fuca Ridge off Vancouver Island, conducted with Alvin’s own lights off (not normal operating protocol), showed a faint clear glow from a vent. Since then, this and other new shrimp species have been found at vents in the Atlantic and Indian Oceans and the Caribbean Sea, but not at Pacific vents. Biologists wonder about and continue to study why vent communities differ from each other and how the animals get from one vent to another one far away. Amid these biogeochemical explorations, Alvin paused in 1986 to visit to one of the world’s most famous ships: the wreck of the Titanic in 3,800 meters (12,500 feet) of water off Newfoundland. Alvin now had new electric thruster motors, instead of its old bulky rear propeller, and the new maneuverability was useful. During this expedition, Alvin made 12 dives to carefully explore and photograph the debris field. It also worked in tandem with a small prototype tethered robotic vehicle, Jason Jr., to explore inside the wreck. The dramatic, evocative images of Titanic received worldwide attention. 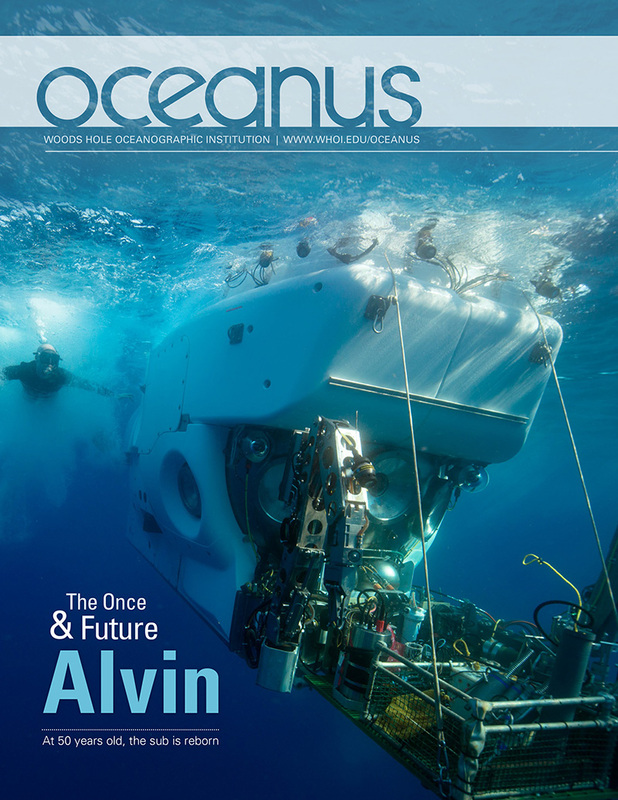 The success of Alvin’s deep-sea exploration and its technological progeny has spawned new generations of remotely operated and autonomous deep-submergence vehicles. The next quarter-century took Alvin to work in the Gulf of Alaska, the Pacific, and Atlantic, discovering and documenting more new deep habitats. In the 1990s off California, Alvin encountered chemosynthesis-based communities living on the decayed bones of a whale, and afterwards helped investigate other such “whale falls.” Scientists theorize that whale falls may serve as oases in food-poor regions of the ocean and steppingstones for animals between food-rich areas. In 2000, exploring a new region of the Mid-Atlantic Ridge, Alvin’s occupants saw 60-foot-tall white carbonate spires, crags, and chimneys loom out of the darkness where the sub’s lights shone. They called the fantasy landscape the “Lost City.” Here lower-temperature methane- and hydrogen-rich, highly alkaline fluids react with mantle rock, depositing different minerals and creating another previously unknown environment and ecosystem. 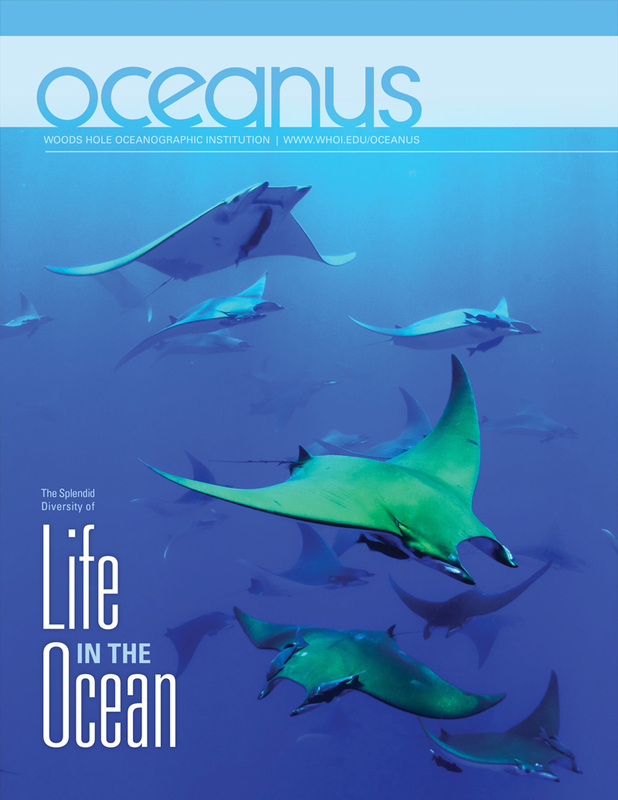 Alvin also explored seamounts, ancient undersea volcano peaks that were found to harbor abundant life—concentrations of fish and unusual deep-sea corals that supported hundreds of species living with and on them. In its final expedition before a major upgrade, Alvin once again responded to a national crisis. It returned to deep coral communities that it had previously explored to investigate impacts from the Deepwater Horizon oil spill disaster. Alvin examined corals near the oil well in the Gulf of Mexico and documented dead and dying corals coated with dark material that later was identified as oil. In December 2010, after 4,664 dives, after discovering hundreds of new animal species and untold new microbial species, Alvin went out of service to undergo a major upgrade funded primarily by the National Science Foundation. In 2014, the upgraded sub, with an array of new capabilities, picked up where it left off, returning to the Gulf of Mexico. To date, Alvin has safely transported about 2,800 unique Alvinauts. More people have been to the top of Mount Everest than to the bottom of the sea in Alvin. Happy 50th birthday, Alvin. Long may you dive. This year, Alvin turns 50, and we want you to help us celebrate.